How To Choose Art For Your Home. 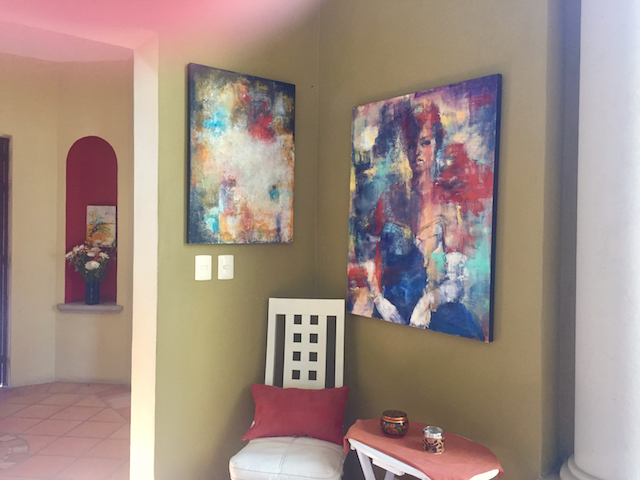 I worked as an interior designer for 10 years when I was the sole support of my three daughters and I always told clients that they should choose art as if they are choosing a friend. It will be something to live with for a long time, something that cheers you when you look at it, and is doesn't matter if it matches the sofa! There are times when we outgrow our friends and our art collections. Both come from an increased awareness of what qualities we want in our associates and our homes. With art, often it comes with growing realization of talent, skill and message of the artist. You can learn about art by looking at a lot of it. Whenever I was in a gallery or museum and encountered a painting that I didn't like, often I would sit down and study it. What was about it that put me off? What was this painter trying to say? What didn't I understand about it? Frequently, I changed my feeling about the work. Not always. 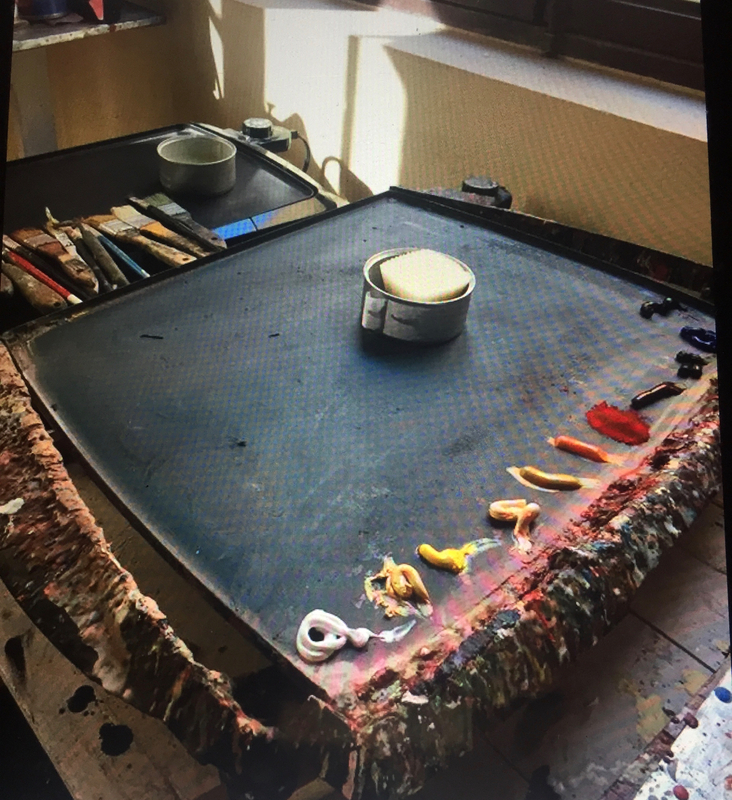 I share a home with a daughter who is also an artist and had been an art dealer in San Francisco for 18 years. She knows more about art than anyone I have ever met. 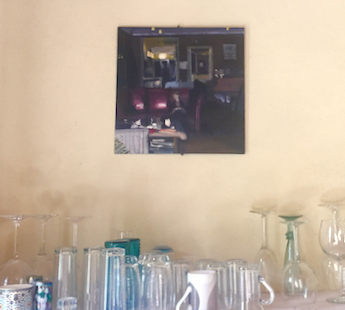 We do confer about what gets hung in our home, and we know the importance of changing the placements of the art at least every 6 months. It is like seeing the art anew. 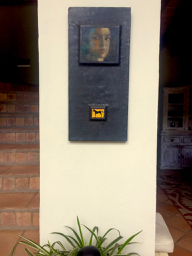 Here are some photos of the art in our home. In the kitchen, yes art belongs in every room, is one of my favorites over a shelf. I do not remember the name of the Spanish artist, but I never get tired of looking at this moody piece. 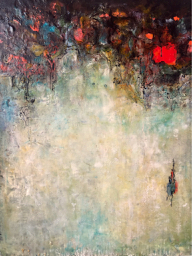 Another of my favorites, "Carmen" oil on lead. 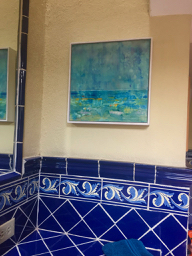 An encaustic painting by Cynthia Hamilton in the guest bathroom. Should Artists Give Work to Charity Auctions? My answer for the last few years has been a resounding NO! Why? 1. It is not good exposure for you, no matter what the charity promoter says. 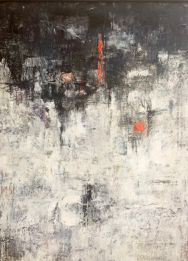 I would love to hear the story of the artist whose career rocketed to success because he or she donated a work to a charity auction and this act alone tipped the first domino toward an avalanche of success coming his or her way. n.
3. 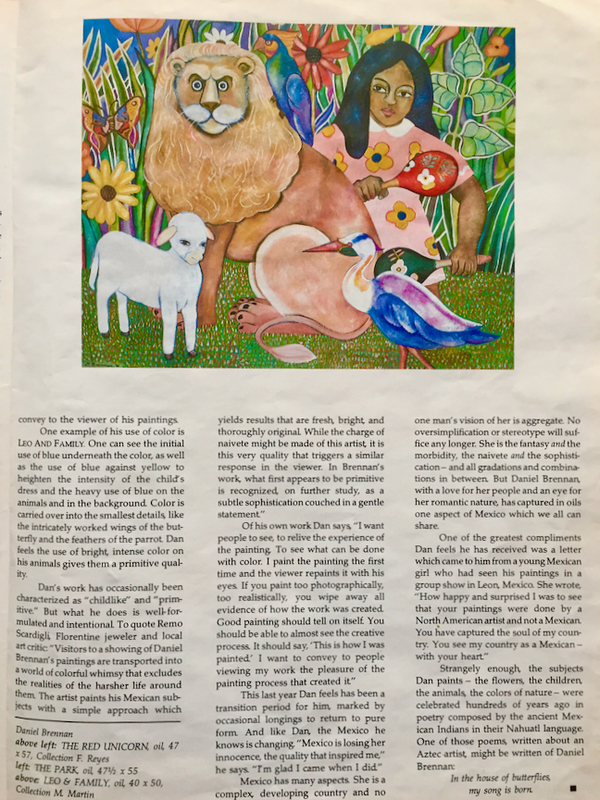 Your work could become devaluated because the collector got such a bargain on your art. If you are a regular contributor to charity sales, your collectors may forgo paying your retail price and just wait for the next auction. That said, I want you to donate some work so medical care will be available to a community that for years felt forgotten by local society. Open up your hearts and let go ( for just a moment) from those wonderful ego enhancing art sales that you have or hope to have. I am all for art sales! It is my income, but there comes a time when you see others needs and want to be part of a better future for them. 11 years ago when Elsmarie Norby, the founder of Ojala Niños, build her home in the indigenous village of San Miguel Viejo, there were no services like internet, cable, landline phones, bus transport or community center, but the main thing the villagers told her was, "We need a clinic." Now the plans are in motion and you can help by contributing a piece of your art or buying art from this auction. All the profits go to the building fund. It will be part of the community center. Children and families will finally have access to medical care, health information and all the support that comes with a nearby functioning clinic. Ojala Niños will build the clinic as part of the new community center. Art and crafts will be donated by well known artists and others who just want to help build the clinic. 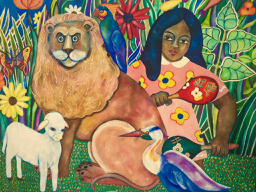 Daniel Brennan, "Leo and Friends" oil on canvas 40" x 50"
Ojalá Niños is a non-profit year round program that gives 100 + indigenous children in this rural community, in the state of Guanajuato, México. the opportunity to explore their strengths through art, music and literacy. All classes are free of charge. Ojala Niños is a daily year round free education program for all the children the rural community of San Miguel Viejo, near the historic city of San Miguel de Allende. They emphasize the importance of social service to develop critical thinking skills, self-confidence and sustainable work ethics. Ojala Niños helps local women learn the cooperative business model and develop hand-made products for sale. This is changing lives. And they need our help. I will begin posting the work on a Face book event page. The online auction will start inconjunction with a very popular concert in the village. Date is July 29th at 2pm. The bidding will continue until July 30th at 5pm. 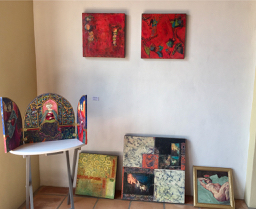 Our home gallery and studios have been a part of the art tours for over a year now. Below is an article about these fascinating visits that I wrote for the local paper. 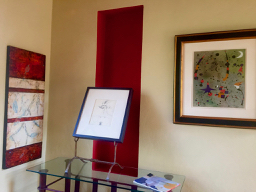 "As an artist, San Miguel de Allende called to me 14 years ago. Even then this magical town was a center of cultural activities and artists. 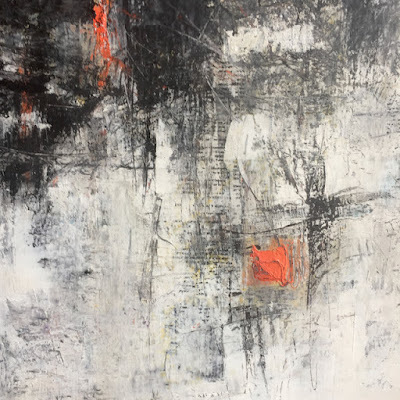 The first night I arrived in my new home, I went to an art opening and someone told me, after discovering I was a painter, “You are in the right place!” I have never doubted that. 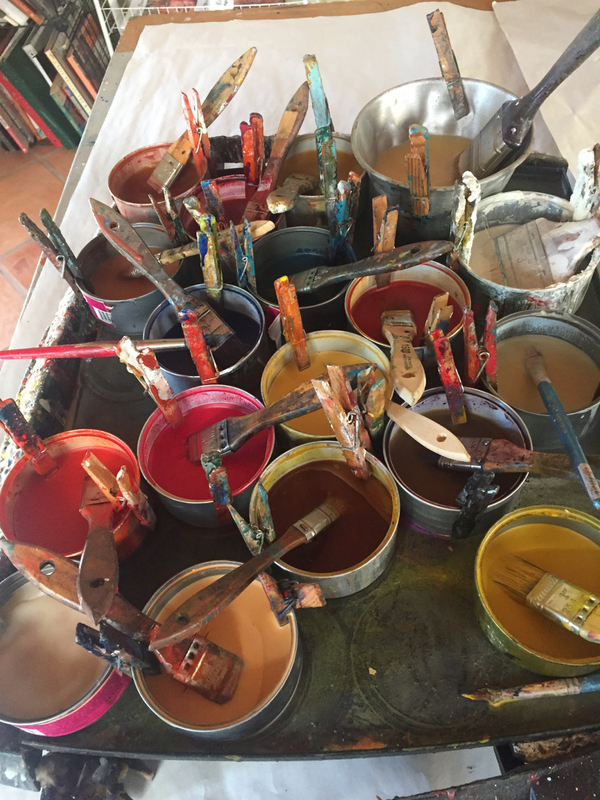 San Miguel has become one of the most popular and celebrated art towns in all of Mexico with hundreds of working artists. Art is the spirit of the town. This colonial jewel has been a destination for artists since the 1940’s and now it continues to be a magical magnet for artists, galleries and art lovers. Constantly evolving and increasingly sophisticated, it is a center of creativity and inspiration in all forms. A strong and constantly evolving community of creative types is welcomed. You will find a haven for artists and aficionados from around the world. San Miguel has developed into probably the most popular and the most famous of all art towns in Mexico with a growing list of art galleries and artists’ studios. Aranda Esparza has the perfect solution. He created Art Tours SMA. 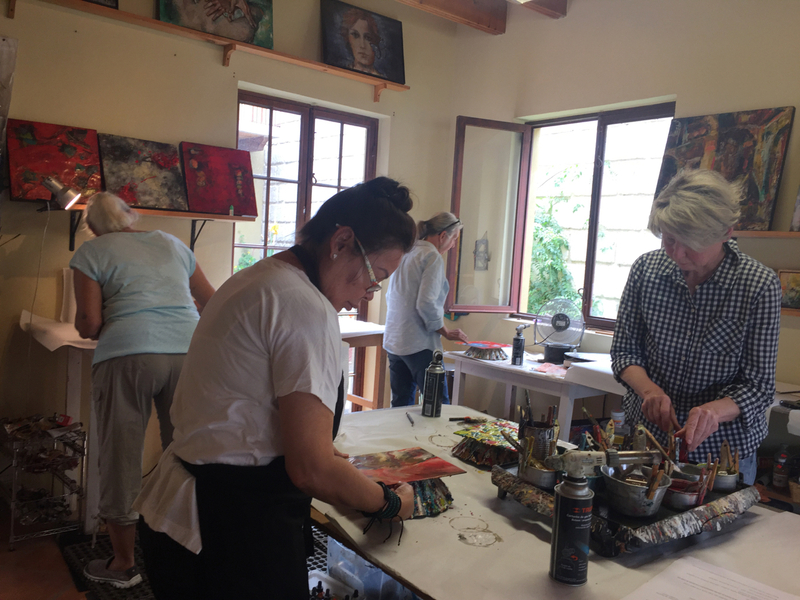 Arturo has chosen some of the best-known artists in San Miguel that are using diverse mediums and brings you to their studios. For my part, I enjoy the tours because I get to meet people that I otherwise would not. 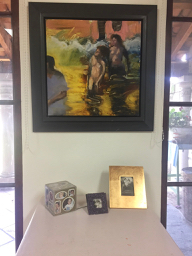 I can discover a bit about my guests, offer refreshments, give a demonstration and explanation of my painting technique and offer a visit of the viewing room in my home gallery. Each artist on the tour will welcome you with a similar, but different experience. If you are interested in art, this tour is a must." For encaustic figurative and portrait painting, my hot palette is laid out the same as my oil painting palette; naples yellow, yellow ochre, cadmiun red light, cadmiun red medium, saguine earth deep, (from R&F paints), white, and sap green. Sometimes, I add purple. I use oil paint straight out of the tube and some powered pigments. I plug the hole in the electric griddle with Bondo so the melted medium floats on the surface rather than drains out. 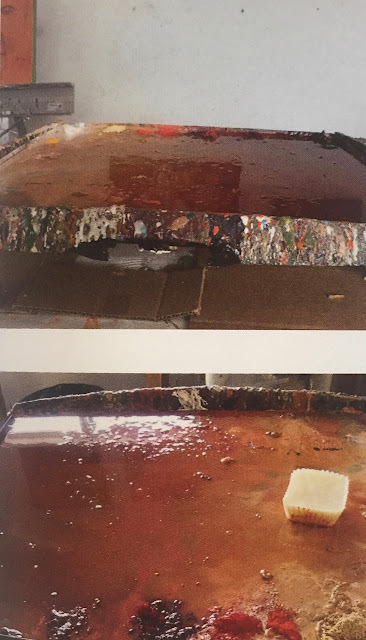 For abstract painting and the encaustic workshops, I have basic color palettes that include, cadmium yellow, cadmium red, yellow ochre, turquoise (this is usually a favorite color for my students) ultramarine blue, black, yellow, alizarin crimson, alizarin orange, (one of my favorite colors) and white. 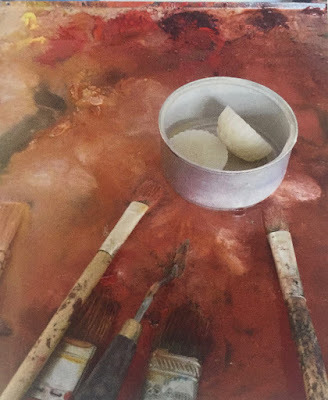 Often I include orange and a red brown. I get some the colors from R&F paints. I love the gorgeous colors and saturation. 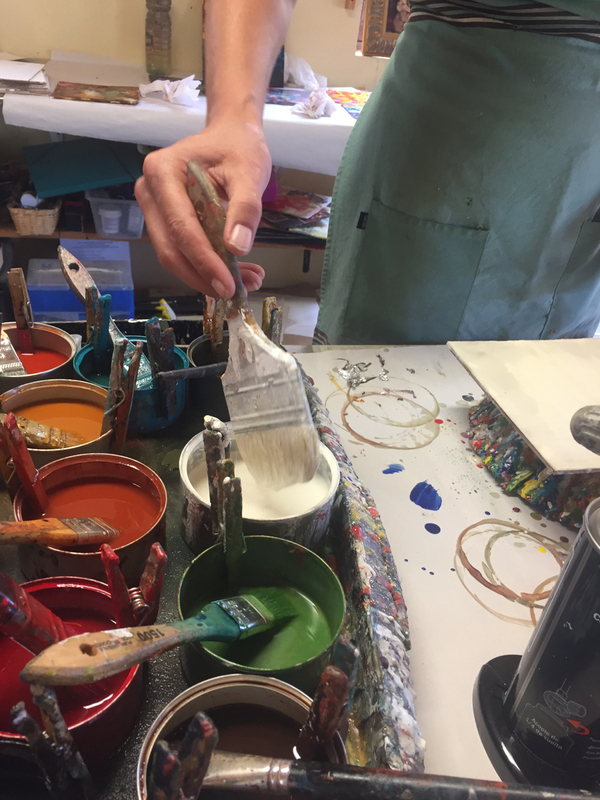 I also make many of my colors by adding powdered pigments to the clear medium. Using those, you must be careful to wear gloves and a mask. I also do that before the class.